A rarely offered behind-the-scenes and bird's-eye view of the Lincoln Memorial on Thursday revealed a big project to replace the roof and restore architectural features on its upper portions — but the bullet mark from World War II will remain. You didn't know about that? See photos and video. 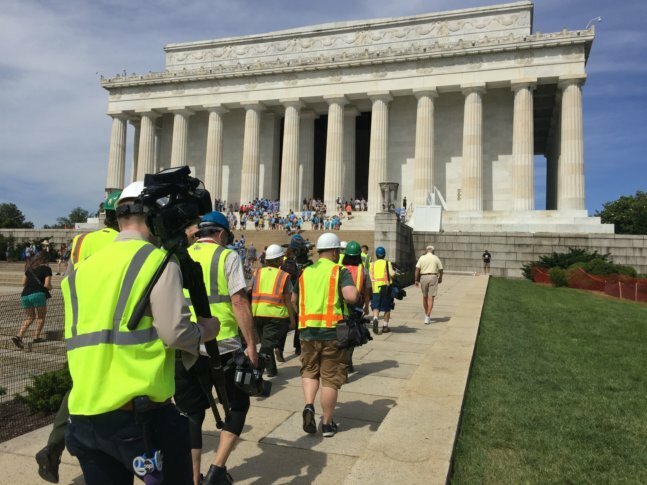 WASHINGTON — A rarely offered behind-the-scenes and bird’s eye view of the Lincoln Memorial on Thursday revealed a big project to replace the roof and restore architectural features on its upper portions. The project began in January and is expected to last until September, but it won’t repair all the damage. A baseball-sized nick in the marble caused by friendly fire during World War II will remain. In 1942, a Civil Air Patrol member with an itchy trigger finger accidentally fired an anti-aircraft gun, leaving the mark in the marble. “You don’t have to stretch it too much to say the Lincoln Memorial is one of the few buildings in Washington, D.C., that came under attack in World War II,” said National Mall spokesman Mike Litterst. “You can almost see it perfectly lining up from 14th Street coming in here,” Litterst said of the wartime battery position on or near the 14th Street Bridge. Some damage to the Memorial’s marble blocks comes from normal aging and from exposure. Some was caused by the magnitude-5.8 earthquake that hit on Aug. 23, 2011. The project involves replacing the roof and filling every open joint and seam in the roof area marble to prevent water damage. Cracks in the marble might be from normal age-related wear and degradation of the stone itself causing settling. “Having movement in different directions at these weak points of the building provide huge opportunities for water ingress, and they’re treated in a very special way, because we are not just about keeping the water out but keeping the building together,” said Tepper. The cost of the $3 million roof and architectural repairs is being split between the National Park Service and philanthropist businessman David M. Rubenstein. What will ultimately become a $25 million project will also improve the undercroft experience. It will expand exhibit space, add a second elevator, upgrade bathrooms and potentially open expansive views into the cathedral-like undercroft level currently not visible to the public. Editor’s note: This story was updated to indicate a change in the amount of the total cost of renovation.